I have spent two days at the Cinecon show in Hollywood so far this week. Because the films playing tonight don’t interest me, and because tomorrow, we’ll be here for fourteen hours, we decided to leave early today and on Sunday. I had to do that to retain Martine’s good will so that we could see a rare print of John Ford’s Upstream (1927) ending around 10:30 pm. The scene above is of Zoo Central in front of the Hollywood & Highland Center next to Grauman’s Chinese Theater. 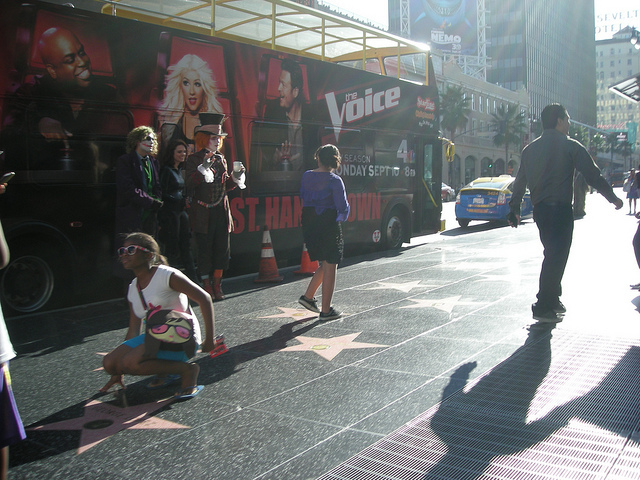 You see one girl at the left being photographed by one of the stars on the Hollywood Walk of Fame. Behind her is one of the tour buses, accompanied by someone dressed as Johnny Depp in some recent movie whose title slips my mind. I have been seeing some great films at the Egyptian, however, especially today. I sat through Robert Florey’s Dangerous to Know (1938) with the lovely Anna May Wong and Akim Tamiroff; Madge Kennedy in Dollars and Sense (1920); W. S. Hart in Wild Bill Hickock (1923); and John Blystone’s Gentle Julia (1936) with Marsha Hunt and Jane Withers, both of whom were in the audience as guests. Last night, Martine and I saw Erle C. Kenton’s Always a Bridesmaid (1943) with the Andrews Sisters. A special treat was a film clip of the famed Nicholas Brothers dance duo, with two granddaughters of Fayard Nicholas tap dancing in synch with what was on the screen. So, on the whole, it’s a mixed blessing: Great films in a particularly nutty place. I will be taking a break from posting to this weblog over the next few days. Every year during Labor Day Weekend, Martine and I have been attending the Cinecon show in Hollywood. While Martine helps my an old friend of mine sell movie memorabilia at Loew’s Hotel at Hollywood and Highland, I will be spending most of my time at the Egyptian Theater watching somewhere between fifteen and twenty old movies that, for the most part, have not been available to the public since they were first released. Many of the titles will be silent with organ accompaniment, with most of the others dating from the early sound era. Typically, there are a few outliers whose originals were on nitrate film stock that has been transferred to safety film and cleaned up in the process. Nitrate stock is a fire hazard, and virtually all films before 1948 or so were shot on it. (I recall seeing the studio version of Alfred Hitchcock’s 1948 production of Rope go up in flames at a USC screening years ago.) Some more recent films had serious problems with fading color which film technicians have been able to restore to their almost original color quality. For more information about Cinecon 48, visit their website for background information, a summary of films being screened, and the screening schedule. 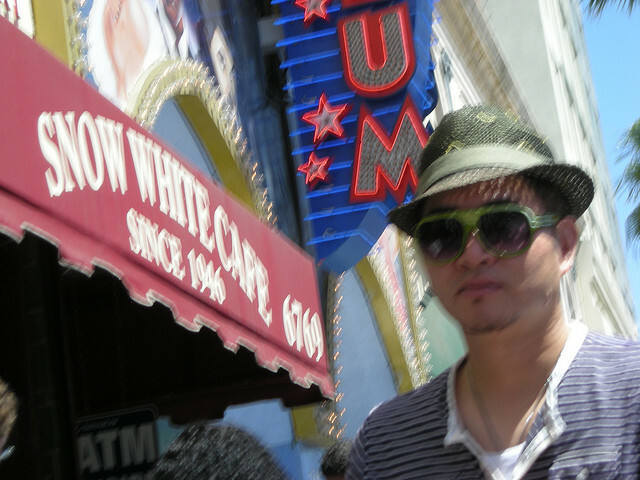 As much as I like old films,spending time in Hollywood will be a drag. Labor Day Weekend almost always brings with it a heat wave.Add to that the problem of finding a decent restaurant on the Boulevard, where most of the eateries are oriented to downmarket tourists who come to stare at the stars’ names on the Hollywood Walk of Fame. Or to the even more downmarket residents of Hollywood, consisting in teenage runaways, low-rent hipsters, prostitutes of multiple genders, and the homeless. It has always amused me that tourists who have failed to do their research come to Hollywood expecting to see celebrities in what has evolved over the decades into a rather ugly slum. The only hope I see for Hollywood is that public transportation improvements, especially with the Red Line, have made it profitable for developers to try to do something to gentrify the place a bit. Everyone wants to be rich, but does everyone want to be like the rich? As one who has spent twenty years working with wealthy clients in an accounting firm that caters to them, I would have to say that, for the most part, the wealthy are not nice people. Superficially, for short periods of time, they can appear to be charming. But when they feel their interests are at stake, there are only two classes of Americans: the wealthy and road kill. We are living at a time when many who are not wealthy idolize those who are. I must ask those people whether they think a Donald Trump would look after their best interests. Now Mitt Romney is passing himself off as a job creator, despite his reputation as an outsourcer of American jobs for Bain Capital. Look back over American history: Why do you suppose American voters did not push for the likes of Commodore Vanderbilt, John Jacob Astor, Jay Gould, Andrew W. Mellon, and John D. Rockefeller to run for president? Perhaps voters were too smart then to vote for thieves. Now they are less smart, and they believe the lies peddled by false radio pundits like Rush Limbaugh and Sean Hannity, who themselves are in the pay of wealthy corporations and individuals. The whole theory of trickle down economics is still making the rounds after more than thirty years. In its essentials, what trickle down economics presupposes is that if you feed the horse enough oats, he will leave something in the middle of the road for the poor. That part is true; but where money is involved, give the rich more money, and—instead of creating jobs—they will salt their cash away in offshore tax havens such as the Cayman Islands. Am I stupid or something? How do the voters who support wealthy candidates like Romney think they are going to share in their candidate’s wealth? Will Romney create jobs? No. Will Romney and his friends get even more obscenely wealthy? Yes. That is a dead certain guarantee. Speaking as one classified in the 99% (a.k.a. road kill), I tend to vote for candidates who have my best interests at heart. Candidates who will do something for America, and not merely for their own capacious pocketbooks.